In the modern-day financial landscape, consumers and businesses are faced with the decision of choosing between either a bank or a credit union. Right now, credit unions serve a little over 100 million members, which includes 43.7% of the economically active population. The growth has been steady for credit unions, averaging between 2-3 million (roughly 2% of the U.S. population) new members per year for the past fifteen years. Banks and credit unions both come with their share of positive and negatives, but one glaring difference has the credit unions lagging behind in the space: the usage of modern tech. 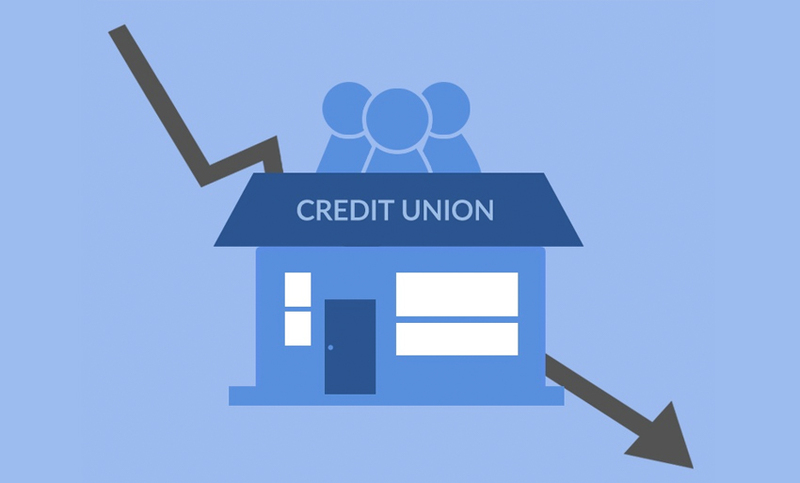 This may be due to the credit unions’ non-profit status and a potentially tighter budget, or simply the fact that they lack of time and manpower. Either way, most credit unions fall short of the digital presence of banks. According to Statista, for example, 32% of Americans regularly use mobile banking on their smartphones–from snapping photos of checks to transferring money to scheduling an appointment with a teller. 51% of Americans use some form of online banking. Large banks such as Bank of America and Wells Fargo have fully embraced technology for their customers, giving them a major competitive advantage over credit unions. The lack of new banking may be a dealbreaker for some. But credit unions are still the right choice for many consumers, offering many benefits that banks do not. So why do credit unions tend to be less tech savvy than banks, given the digital landscape of the market today? In a report by Mark Shevlin, 7 in 10 credit unions find keeping up with technology to be challenging. Only 12% of mobile credit union applications have automatic bill pay: a primary use for mobile users. According to that same report, many credit unions are constrained by a lack of executive commitment to IT, poor coordination between IT and business departments, and a general aversion to IT risk. A few greater points are worth noting. As non-profit entities, credit unions have to be particularly careful when considering their return on certain investments. Although convenient banking applications and online banking are always free to the consumer, they can be costly to create, maintain and upgrade. According to the Credit Union National Association, half of the credit unions in the U.S. had less than $19 million in assets at the end of the third quarter of 2011, making the financing of this technology a want, but not necessarily a need. In many other cases, credit unions simply don’t have the resources to develop a digital member-facing strategic plan. Banks are setting the standard with high level digital banking presence, forcing credit unions to stay current to compete. Many consumers are going on credit union websites prior to joining to make sure they aren’t archaic, or even worse, non-existent. Ultimately, in order to increase customer engagement and stay current with the modern technology trend, credit unions need to become more tech savvy. Should Credit Unions Jump on the Mobile Banking Bandwagon? Playing devil’s advocate, certain studies show that mobile banking hasn’t caught on as much as people like. According to a survey released from the Federal Reserve Banks of Atlanta, Boston, Dallas, Minneapolis and Richmond, while 30% of respondents said the point of developing a mobile application was to earn new customers, a nearly equal 26% said that it was simply to put pressure on the competition. But should credit unions give in? According to The Financial Brand, just 4% of financial institutions reported that more than half of their retail customers were enrolled and active users, while 80% reported that less than 20% are active mobile banking users. Many people avoid these banking applications because of security concerns. They worry that putting confidential banking information into a phone account makes them more susceptible to getting hacked. Others simply aren’t aware that a mobile banking presence exists for their financial institution. Credit unions do have distinct advantages: lower APR rates, non-profit status (have the consumer’s best interest in mind), lower fees, and the local, small business touch are all differentiators that could continue to win over new customers. However, there is still an overwhelming consensus that mobile applications are becoming the norm for both banks and credit unions. The question is, what options do credit unions have? While large juggernaut banks can afford to give the latest and greatest in technology, credit unions likely don’t have the budget. However, if they focus on the features that consumers use the most: checking balances, ATM branch locator, bill payment, and for mobile the remote deposit capture (nearly 90% of organization plan to offer this feature in the next twenty-four months). If a credit union is able to offer a digital interface that can accomplish these primary user needs, then they are likely to keep their customers happy while still being able to boast modern day technology presence. The Water and Power Community Credit Union has a simple website that offers ATM location, account summaries, transaction history, bill pay, and transfers. As mentioned before, many credit unions do not have the time or resources to develop and maintain their own online or mobile presence. As a result, they often rely on third party application developers to to brand the application to make it look as if the app is maintained by the customers’ trusted financial institution. Mint, HomeBudget, and Spendbook are three popular applications that allow for bank and credit union users to upload their banking information and then pay bills and manage finances. While it’s not directly affiliated with the bank, the customer can connect their bank to these programs and get all of the perks of managing their credit union accounts. The credit union itself does not need to front any cost to refer their users to these applications. mFoundry, which was acquired recently by FIS, is an example of a third party developer who works specifically with financial institution applications. They handle every aspect of the app, from design to maintenance. It saves valuable time and resources for a credit union, as they do not have to hire internally. As customer’s fear of security with mobile apps is the number one reason for avoiding it as a means for banking, the number one most important thing when selecting a third party is to make sure your application is secure. Statistics show that it may be worth the cost on the front end for the potential return on the back end. A Forrest Consumer Survey found the potential return to be 15.7%, on average. Where’s this number come from? For one, when U.S. users of online banking were asked how it has changed their use of banking channels, 43% said they had made fewer calls to their bank’s call center, and 35% said they visited branches less often than they did before they went to online banking. In the Forrester model, a credit union with 500,000 members could save $150,000 in reduced traffic alone. That same Forrester survey found that 18% of users are more likely to buy more products from the banks or credit unions they use for online. This too, could generate revenue that wasn’t there before. In a Financial Brand study, Compared with 1.3 products for branch-only consumers, mobile banking users average about 2.3 products each from their primary financial institution. For new adopters of mobile services, however, the average number of products per customer increased by 12%. This was for both banks and credit unions. One other statistic is the effect technology has on the bank attrition rate. In larger credit unions, members not enrolled in online banking tended to attrite at nearly three times the rate of enrolled members (13.4% vs. 4.9%). Among smaller and medium sized credit union, that number was even smaller at 2.8% for mobile and online bankers. Simply put, the advantages to having a digital presence all relate back to a having a better, more well rounded customer experience. Alliant Credit Union is said to have one of the best mobile credit union apps, in addition to checking all of the usual boxes, it offers management tools for budgeting and powers its transfers through PayPal, allowing them complete large transfers. They also allow up to $20,000 to be transferred a day via their mobile application. It’s given them nation-wide recognition as the strongest credit union mobile presence. Whether credit unions choose to modernize with technology or stick with their roots as a brick and mortar, marketing their services to their customer is key to continuing their growth. Credit Unions have distinct advantages for specific customer profiles. Modern banking technology is simply another tool in the customer experience toolbox. As long as there is a demand for a more convenient, streamlined customer experience from consumers, banks and credit unions will have to continue to keep pace.